Click on the Play Button and 'Outbreak 2012' will start after this message... Thanks for waiting! After surviving the first zombie wave, John and Sam decided to start looking for survivors together. Launch baseballs and hit the zombies' heads! New levels, weapons and more fun! Use your bazooka and get rid of the zombies. Try to get the three stars in each level. 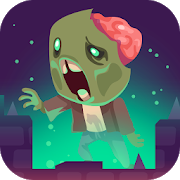 In this zombie version, you have to crush little creatures with all kinds of weapons you'll start with some darts, but will unlock new weapons as you make progress. Relieve some stress! Cut zombie heads and launch them as far as you can. Share this game with your Facebook friends and challenge them who will get the record? You've been infected while in hospital and you turned into a brain-eating zombie. You have 60 seconds to take as many as you can! Use the arrow keys to move and the space bar to bite.